There are a lot of package managers in use today, but the only popular one (to my knowledge) that is designed to support + works by default with nested dependencies is npm. 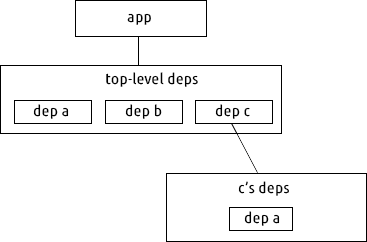 In the above diagram the deps containers represent isolated sets of dependencies. In most package managers there is only a single 'namespace' for all dependencies. I refer to this behavior as 'flat' because it means you only have one level of discoverability when resolving a dependency, which means you can only have one dependency called 'foo' in your entire app. Let's look at a close-up example of how dependency resolution works in a flat dependency system. In this example we have three dependencies. 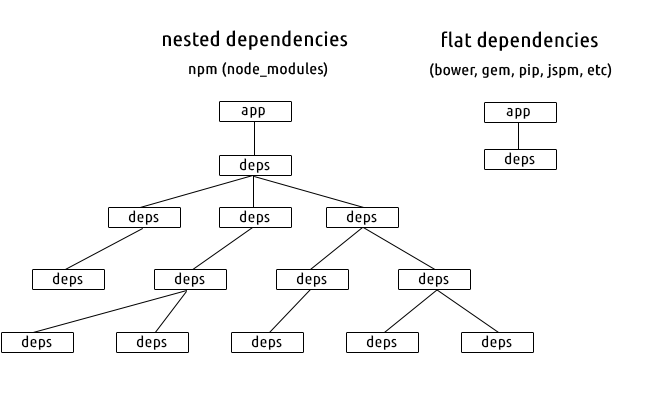 The black lines represent 'depends-on' relationships, so our app depends on a, b and c, and c depends on a. So both our app and c depend on a. Because the dependencies are flat, meaning we can only have one copy of a in our entire app, it means we have to make sure that both our app and c both depend on compatible versions of a. If we want to upgrade c to a newer version, but that new version also upgrades a to a version that in incompatible with the a that our app depends on, we have a dependency conflict. This phenomenon is referred to as "DLL Hell" (from Windows) or more generally "Dependency Hell". Let's look at the same example but in a nested system. Here we don't just have one level of dependencies, we have multiple. Assume a and b have no dependencies. Our app and c both still depend on a. With nested dependencies we now have two copies of a. If our app needs a at version 1 and c needs a at version 2 then there is we just install both versions of a. The dependencies of c are only available to c, nothing else can access them. Additionally, if it turns out that our app and c both depend on a compatible version of a, we never need to create the c's deps folder -- so the behavior in that case would mimic flat deps (this is how npm dedupe works). The simpler of the two designs. It's up to you to decide how much complexity you want to deal with. Installs multiple copies of dependencies (when necessary), so takes up more disk space (though in practice this is rarely an issue because code is small).